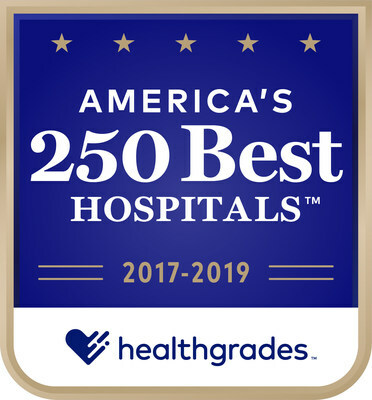 SILVER SPRING, Md., Feb. 14, 2019 /PRNewswire/ -- Holy Cross Health today announced that Holy Cross Hospital has achieved the Healthgrades 2019 America's 250 Best Hospitals Awardtm. The distinction places Holy Cross Hospital in the top 5 percent of more than 4,500 hospitals assessed nationwide for its superior clinical performance as measured by Healthgrades, the leading online resource for comprehensive information about physicians and hospitals. "I am pleased that Holy Cross Hospital once again has been recognized as one of the top-quality hospitals in the nation," said Holy Cross Hospital President Louis A. Damiano, MD. "We are proud to have earned this award for our culture of quality and safety, and we are even prouder of all the doctors, nurses, allied health professionals and other colleagues who are committed to consistently delivering excellent care for our patients." Holy Cross Hospital is the only hospital in Montgomery County and one of only five in Maryland to be recognized with this award for three consecutive years. "Consumers have several hospitals to choose from, so it's important they understand which hospitals achieve the best clinical outcomes," said Brad Bowman, Chief Medical Officer at Healthgrades. "Recipients of the Healthgrades America's 250 Best Hospitals Award are setting the bar in patient care." And during that same period, if all hospitals performed similarly to those achieving the Healthgrades America's 250 Best Hospitals Award, 168,165 lives could potentially have been saved. The Holy Cross Health system has a demonstrated track record for superior performance in caring for patients across multiple service lines. As a leader in providing innovative and quality health care, Holy Cross Health has received numerous clinical awards, recognitions, designations and accreditations in areas such as joint, spine, gynecologic and bariatric surgery, as well as stroke care, women's health and oncology. In 2019, Holy Cross Hospital was also recognized by Healthgrades with the America's 100 Best Hospitals for Critical Care award, the Critical Care Excellence Award, Five-Star recipient for Treatment of Sepsis, Five-Star recipient for Treatment of Pulmonary Embolism and a Five-Star for Treatment of Respiratory Failure. For media inquiries, contact Kristin Feliciano, chief strategy officer, Holy Cross Health, at 301-754-7017. To learn more about Holy Cross Health's awards and recognitions, visit www.HolyCrossHealth.org/Awards.